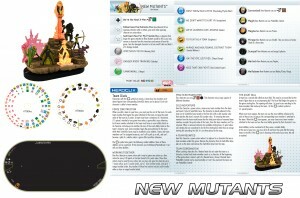 WizKids is showing off another team base included in the Wolverine and the X-Men set with a look at the New Mutants. Today we continue our preview of Marvel Heroclix: Wolverine and the X-Men with another team dial from this latest X-citing X-pansion. We are pleased to present the junior class from the Xavier School for Gifted Children, the New Mutants!